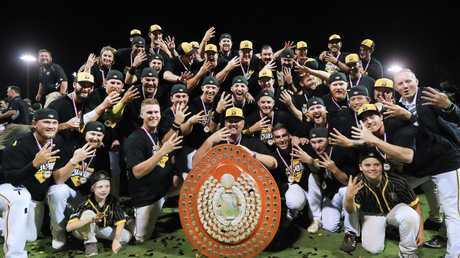 QUEENSLAND batters ran hotter than the long summer in an early blitz which took the Brisbane Bandits to an unprecedented fourth straight Australian Baseball League crown. Bandits Andrew Campbell and Wade Dutton cracked solo home runs in the first two innings of their second game of the championship series against Perth Heat on Saturday night, before runs batted-in from Logan Wade and David Sutherland took Brisbane to an 8-0 lead after just three innings. All four men learned their baseball in Queensland and have been seasoned contributors to a fourth Claxton Shield win at Onehub Stadium for head coach David Nilsson which was clinched by a 9-4 triumph. 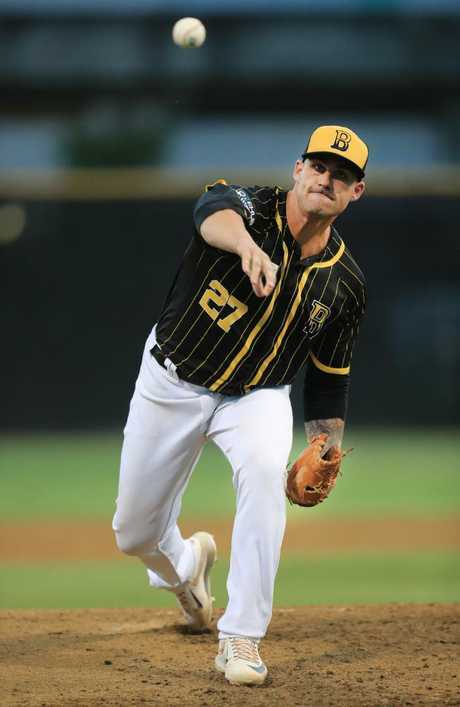 Former Canberra and Sydney pitcher Tim Atherton controlled a championship series game for the Bandits for a second straight year, working through eight innings and striking out 10 batters. This season was the first in which Baseball Australia had put in place a private ownership model. Clubs owners from Australia, South Korea and New Zealand did not sign up with the ambition of finishing second behind the three-time champion Bandits again. But Brisbane negotiated a mid-season battle, in which they had up to seven frontline players out injured, to win 10 of their last 13 regular season games to finish with the best win-loss record giving them home advantages in the playoffs. Brisbane Bandits with the prestigious Claxton Shield. (Brisbane Bandits) - Photo: SMPIMAGES.COM /ABL Media. The Bandits took care out of business with the air of quiet authority and explosive hitting which has typified their reign over Australian baseball. A Perth team which had the best runs total and best on-base percentage in the ABL regular season was overwhelmed as the Bandits again played widescreen baseball at their intimate home ground. Campbell and Dutton put Perth starting pitcher Conor Lourey over the centrefield fence and Lourey was withdrawn in the third inning. Wade, with bases loaded, singled nervelessly against Heat reliever Nick Veale for a 3-0 lead. Two wild pitches by Veale gave TJ Bennett and Sutherland the chance to rush home either side of 33-year-old Sutherland's ripping double off Veale which scored three runs. Atherton yielded solo home runs in each of the fourth, fifth, sixth and eighth innings to Peter Kozma. Chris Clare and Robbie Glendinning (twice), but kept a reassuring scoreboard buffer. Bennett, the ABL's leading regular-season home run hitter with 13, added insurance with a fourth-inning fence-clearer off Veale in the bottom of the fourth for a 9-1 lead and gained another deserved championship with Brisbane. The fourth straight Bandits championship came a week after another Brisbane sporting team, the Women's BBL Brisbane Heat, gave the city another national competition title. 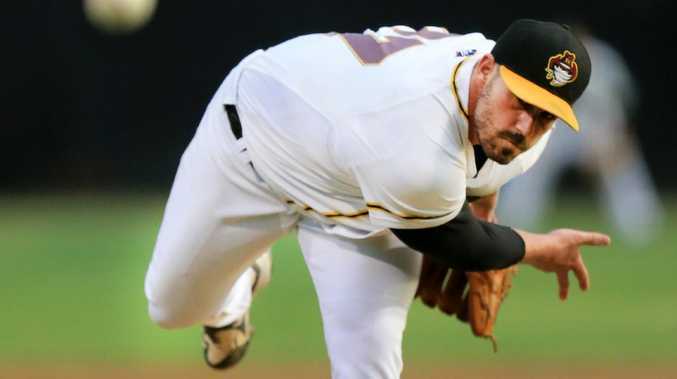 Atherton, the 2017-18 championship series most valuable player, had a 7-0 win-loss record for the regular season, the best of any ABL starting pitcher. Armed with a 3-2 win in Perth on Thursday night, Nilsson started Game Two with Queensland catcher Ryan Battaglia after the bulk of the season's games had seen import Danny De La Calle behind the plate. Atherton was the championship series most valuable player for a second straight year. "That's probably the best feeling in my life, other than family ... the adversity we had to overcome this season" Atherton said. I don't know if we were in contention during a series against Canberra, but we took advantage of our opportunities. "It wasn't the greatest performance but the boys put the score up for me."